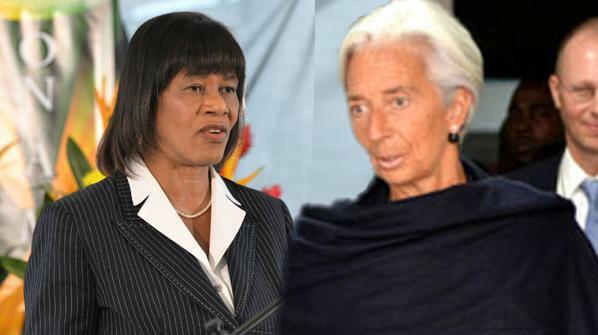 The visit of Christine Lagarde, managing director of the International Monetary Fund to Jamaica June 25 – 27, represents a game changer from the almost 40 years of bitter and acrimonious relationship between the government administrations of Jamaica and the FUND. This bitter and hostile relationship prompted former prime minister, Michael Manley, in 1978 to proudly claim that “the Jamaican government will not accept anybody, anywhere in the world telling us what to do in our own country. Above all, we’re not for sale.” This was Manley’s message to Jacques de Larosière, then managing director of the IMF. Manley’s archrival, former prime minister, Edward Seaga, in criticizing the harsh conditions of the IMF made the point in the 1980s that, “it is as if the prevailing wisdom dictates that since there is no path of painless change, it matters not how painful the price of change may be. But it does matter. It matters to the human element which in the final analysis is … the target of the adjustment process. We do not adjust economic systems. We adjust the lives of the people who make these systems work. It is short-sighted in the least to ignore the human element”. “Conventional wisdom holds that governments turn to the Fund for a straightforward reason: they need an IMF loan. An alternative argument is that governments want IMF conditions to be imposed to help push through unpopular economic reforms”. Maybe the JLP’s current spokesman of the economy, Audley Shaw can assist us by giving us an insight for his administration going to the IMF in the first place in 2010.
Credit must be given to the steady hands of minister of finance, Dr Peter Philips, for staying the course and for successfully achieving the conditions outlined in the country’s letter of intent with the IMF. It is true that “a rising tide lifts all boats”, and that improvements in the general economy will benefit all participants in that economy, and that economic policy, particularly government economic policy, should therefore focus on the general macroeconomic environment first and foremost. But rising tide lifts all boats in equal portion and leave unchanged, inequities. There are gaping differences between the haves and the have nots. So while we are successful moving the macroeconomic indicators in the right direction, the urgent task left to be addressed is the people’s agenda. It is fashionable in the discussion of growing poverty in Jamaica to take the path of least resistance with the usual cliché, low productivity, crime and violence, teenage pregnancy, single female-headed households, family size etc, all blaming the victim. It is good to know that in respectable circles the conversation is changing from what was once dismissed as a liberal obsession or socialist diatribe, to the issue of inequities. Jamaica is now the poster child of the IMF success after its failed effort elsewhere to bring about the illusive growth and economic sustainability that a borrowing relationship with its harsh conditionalities promise. The success of the Ministry of Finance in passing four consecutive tests gives the Portia Simpson Miller administration considerable leverage and the opportunity to bring to the table the burning issue of inequality–the balancing of people’s lives. In this respect, there is convergence of thought with the managing director of the IMF and the prime minister, not just to broadening the safety net by increasing the number of (stopgap) PATH beneficiaries but a genuine effort at bringing marginalized people into the mainstream of economic activities. How long will this social peace last or the considerable social capital of Sister P endure faced with the cruel and devastating impacts of the insidious crawling peg devaluation on the cost of living of the poor and vulnerable? How much time does Sister P have left where she can continue to pacify the hungry and angry masses as the pot of discontents boils? Miss Largarde understands well the dilemma of Portia to bring about economic stability and at the same time satisfy the reasonable expectation of her constituents, the poor, weak and the marginalized. In other words, balancing the books while balancing people’s lives. The ironic twist is that Portia Simpson Miller came to power on a wave populism, with a mandate from the ordinary Jamaican to fix once and for all the structural inequities that abounds, only to find herself on course, as the leader, to achieve that which has eluded the arch capitalist party, a successful structural adjustment programme that will put Jamaica on a path of sustainable growth. These two women both have a score to settle in structuring a framework that would fulfill the dream and aspiration of Michael Manley: a new world economic order. Miss Largarde has very little time to achieve her objective of reforming the International Monetary Fund, for, as we speak, at her back, she can hear Time’s winged chariot hurrying near, because back home there are those who are plotting against her. And Portia has two and half years before the next general election. This is a meeting of historic proportion.